With the end of term fast approaching we're taking a step back and reflecting on what we've achieved and all the things we've learnt. We've been using our blog to share some of the activities for some time now and have really appreciated all the comments, and feedback from everyone. We really hope that you've been enjoying these glimpses from our classrooms, and would now like to share a little more with you. After each lesson we spend some time reflecting on what we covered, strategies we used to help us, what we had trouble with and what we may have discovered. Today we wanted to share some of our thoughts with everyone, and are trying something new to spread the word, so let us introduce you to our Twitter account! You've probably heard of Twitter or seen messages across the screen in some TV shows. But what exactly is it? Basically, Twitter is a short message service that allows us to send messages to the world. We can also share pictures, videos and our favourite websites. We can send messages directly to people, and we can 'follow' people so that we receive all their messages too, hopefully we can attract some followers ourselves. We are currently following our Prime Minister, Julia Gillard as well as more local people and places such as the Wangaratta Library to name a few. Twitter is a great way for us to keep up to date with people and events and to share our news too. You can create your own free twitter account and follow us, or check out the homepage of our blog to see our messages displayed. So every time you visit our blog, please be sure to check out the twitter feed and see what we've been up to. So now you know how we're using twitter, head back to the homepage and see what we've learnt this week! 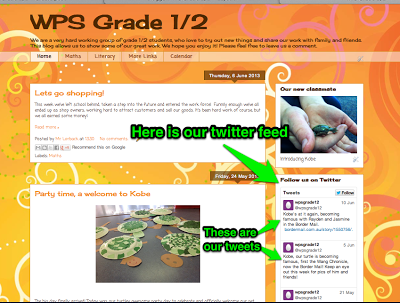 Students will be regularly adding tweets as a reflection tool and keeping up to date will help with discussions at home and allow us to share more of our learning!